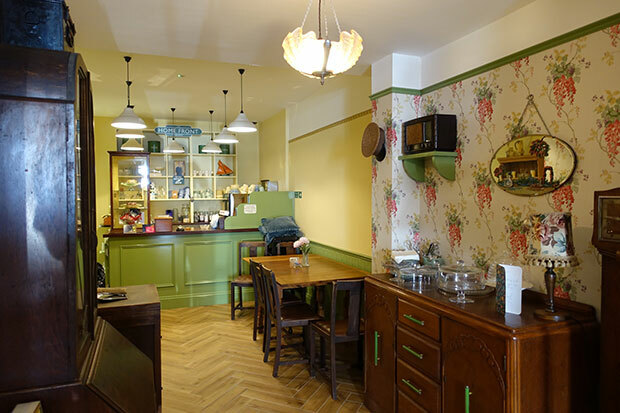 The Home Front Tea Room is the culmination of a five year plan which has evolved from a love of the camaraderie of the 1940s and the great British tradition of the cup that cheers. Ramsgate was the obvious choice for this exciting new venture, as it has many connections with WW2. In 1940 hundreds of “little ships” set off from Ramsgate’s Royal Harbour as part of Operation Dynamo, rescuing stranded troops from the beaches at Dunkirk. The yacht “Sundowner” brought back 130 men and is moored a short walk from our tea shop. A pleasant short stroll along the seafront will take you to the Ramsgate Tunnels that could shelter up to 60,000 people as the town endured the most bombing of any town during the blitz. Located just outside Ramsgate is the former Manston RAF base, active during World War Two and now home to the Spitfire and Hurricane museum and the RAF Manston History Museum. At the Home Front we offer our visitors the chance to experience the atmosphere and surroundings of a 1940s environment whilst enjoying good quality products, such as cakes, scones, sandwiches, cream teas, soup and various light lunches. For further details of food and beverages, see our menu page.